Scientific skepticism is healthy. Researchers should always challenge themselves to improve their understanding. But climate deniers are not there. With weak roots in scientific facts they throw out allegations, speculations and unfounded criticism of evidence supporting anthropogenic global warming. Who benefits from a continuation of the oil age? Who is willing to risk our children’s and grandchildren’s future for short-term profit? Who opposes a rapid transition from fossil fuels to renewable energy? Is anthropogenic global warming and war two sides on the same coin? Make 2014 the climate year! Ban Ki-Moon invites the world to a climate summit for action in 2014. The UN needs popular support for this quest. Let’s be realistic and demand the “impossible”. One thing is for sure – we cannot continue the irresponsible habits we have now. We have to get out of the fossil fuel age for several reasons…more. Two or three degrees more – does it really matter? Out of fossil fuels now! For the last two hundred years fossil fuels have been the basis for industrialization and development of our modern civilization. Fossil energy has been absolutely necessary to get us where we are today. However, our civilization must grow up...more. In the Copenhagen accord 167 countries agreed that to avoid reaching dangerous tipping points, global warming should not exceed 2 centigrades. Unfortunately, the two degree target is no guarantee against a runaway greenhouse effect. Some people think this goal is probably impossible to keep, and that it is a cover-up. The two-degree limit is more based on political negotiations than on science. The scientific majority prefers a less than one-degree rise in global average temperature to feel safer. Risking a one degree rise might be similar to playing russian roulette with one bullet in the magazine. A two degree rise might be equal to load it with two bullets. Another degree means a third bullet load. You point your russian roulette gun at your grandchildren. The likely outcome is “Hell and high water” in our childrens lifetime. The worst case scenario is the Venus syndrome. Every day we burn a staggering 90 million barrels of oil and a corresponding amount of coal and gas. The production of CO2 as an inevitable result is over 35 billion tonnes of annual emissions of carbon dioxide added to our common atmosphere. This CO2 does not just vanish. Some of it is absorbed by vegetation and seas. Some of it remains in the atmosphere for decades or centuries. if we burn all the oil and coal, our climate- and ecosystems will pass catastrophic tipping points. the demand for expensive oil will go down when increasingly efficient energy sources like solar, wind, tidal and geothermic replace polluting fossil fuels. the political costs of continued channeling of rivers of petro-dollars to brutal, fundamentalist and corrupt regimes in the Middle East, the only place left with cheap, conventional oil, are far too high; for their own populations as well as for the rest of the world. Big oil, also called petroleum supermajors, exert an enormous political power worldwide. Obviously these companies can and will do anything to keep the fossil fuel paradigm going as long as possible, and they have plenty of clout to obstruct the inevitable change for quite some time. The big reserves of cheap, conventional crude oil are concentrated in the Middle East, controlled by regimes or persons with agendas of their own. Extreme islam = petro-islam= “beduin”-islam = wahhabists and salafists. The most fanatic are apocalyptic mahdis, and like some extremist christians and jews they are looking forward to and promote the apocalypse. The one reason wahhabists and salafists are counted in millions rather than thousands is oil. Petro-islam to a large extent controls and instructs US big oil and their propaganda machinery. They instruct Rupert Murdochs media empire and Fox news. They increasingly buy western banks. Fossil fuel societies are vulnerable to delivery failure and wild price fluctuations. Fossil fuel societies depend on the good will of corpocratic groups like Big oil and petro-tyrants. The global annual emissions of carbon dioxide are estimated to be more than 33-34 billion tonnes and increasing. With business as usual, global emissions are estimated to be over 50 billion tonnes 15 years from now. Some of this is absorbed by soil and vegetation. Some is absorbed by the oceans, causing serious acidification. Some of it remains in the atmosphere for decades or centuries, leading to accumulation of CO2 in the air. If the oceans continue to warm, the risk is that they reach saturation level and stop absorbing CO2, eventually start emitting CO2 back to the atmosphere. If this situation occurs, it might trigger an escalating, run-away greenhouse effect, an event associated with the Paleocene–Eocene Thermal Maximum (PETM) that took place 55 million years ago. At that time 20000 years was needed for an increase of 6°C. According to the IPCC business as usual scenario, we shall only need 100 years this time. It is the big, natural feedback mechanisms that are decisive for the scope of climate change. A warmer polar sea and melting permafrost entail the release of frozen methane, a very strong greenhouse gas, and triggers the ice-albedo feedback loop. IEA (2012) World energy outlook. “A recent projection places the total value of conventional global fossil fuel subsidies between $775 billion and more than $1 trillion in 2012, depending on which supports are included in the calculation.1 In contrast, total subsidies for renewable energy stood at $66 billion in 2010, although that was a 10 percent increase from the previous year”. “… the climate goal of limiting warming to 2 °C is becoming more difficult and more costly with each year that passes… almost four-fifths of the CO2 emissions allowable by 2035 are already locked-in by existing power plants, factories, buildings, etc. If action to reduce CO2 emissions is not taken before 2017, all the allowable CO2 emissions would be locked-in by energy infrastructure existing at that time. Rapid deployment of energy-efficient technologies –would postpone this complete lock-in to 2022, buying time to secure a much-needed global agreement to cut greenhouse-gas emissions. Coal, oil and gas – the fossil fuels – are stored solar energy from a distant past. 400 million years ago, the sun was weaker, but there was much more CO2 in the air. Over hundreds of millions of years since then carbon has been absorbed by plants, trees, algae and animals, eventually ending up on the bottom of swamps, lakes or ocean floors – with time transforming into coal and oil. We are now all involved in the largest experiment ever: recreating the Jurassic climate on a global scale, by returning the naturally stored carbon back into the atmosphere – this time with a warmer sun. What happens now, is no climate variation, it is a real climate change. The solar forcing – the insolation – has not increased the last forty years. There is no special warming Milankovich effect like we had in the Holocen optimum some 6000 years ago; there are no big non-eruptive volcanoes pumping greenhouse gases into the air. There is no other explanation for the present global warming than human activity. We can already observe how the Earth’s climate and with it the world’s ecosystems are changing at an accelerating pace. As long as the increase is due to greenhouse gases only, the change will be fairly slow and predictable. When the big, natural feedback mechanisms are activated, the changes might take place rapidly. The long-term trend is clear – the average global temperature is currently rising on average by 0,2°C per decade. The changes are irreversible from a human perspective. The world as we knew it, is gone. We can only make more or less educated guesses at how the new world will look like, limit damages and adapt to it as best we can. The new paradigm: renewable energy sources and sustainable development. Petroholics will to their last sip tell the world they are fine, and that there is no danger ahead. Petro-addicts have no will of their own, just barely managing to arrange for their next petro-fix. The risk of choosing the fossil fuel paradigm option (or business as usual) as long as possible is that you might be perceived as being accessory to or partly responsible for the permanent establishment of a depleted, polluted and impoverished world with enormous wealth accumulated by a few thousand multibillionaire tyrants combined with increasing poverty for the majority, or worse: in addition stealing the future from our children and grandchildren. 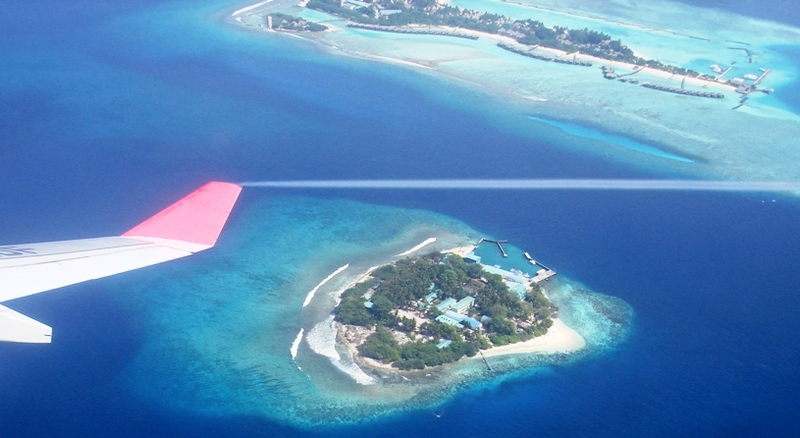 The Maldives and other low-lying small islands may serve as warning “canaries in the coalmine” in our global experiment with the greenhouse effect. Video on our new 2012 climate | Temperature records & pie charts | What happens if temperatures increase by 10 degrees? Phasing out fossil fuel subsidies ‘could provide half of global carbon target’ | Why do we pay energy giants to wreck the Earth? | Exxon Mobile CEO against people who care about the planet | End fossil fuel subsidies | Top two oil companies make USD 160000 per minute and hardly pay tax | 3 ways climate fights are won at local levels | What happens when the Kyoto protocol expires? Climate change agreement – What happened at COP 17 in Durban? What will the tipping point for mainstream society to take action against climate change be?